patrick & rebecca are married // echo park, los angeles wedding — likemorningsun photography // wedding & portrait photography for adventurous souls. when rebecca emailed me just a few weeks before her wedding, she shared her and patrick's story, and i KNEW i had to be a part of documenting their day. "Though Patrick and I both attended a small college in Fullerton and our circles of friends overlapped, we never met. Years later, friends through the magic of Facebook, I saw that Patrick was taking the train from Fullerton to L.A. on the same day that I was taking it in the opposite direction to see a friend in Patrick's town-at-the-time. Boarding the train car, I saw Patrick sitting with his friend. A catch-up conversation ensued for the half-hour ride, and when my friend texted that she would be late, Patrick suggested that I kill time with sushi and a cocktail at the restaurant he ran near the train station. He SAW me. Over the next couple of years, we saw each other on the rare occasion when Patrick would venture north to see a show, but it wasn't until he moved to L.A. that I decided it was time to make good on a deep, gut instinct that this guy might last longer than my usual 6-date relationships. We both love to travel without maps, whether through the streets of Paris or the unknown wandering ways of life. We've started new traditions - clinking coffee mugs each morning to cheers the new day to reading Mary Oliver when the world's news is distressing. We are excited to venture into this next phase of our relationship without a map - trusting each other as we continue to explore the ways each of us sees, engages, and is changed by the world and our community." their wedding was wonderful and magical and full of so much joy. patrick and rebecca got ready together in their little bungalow in the heart of echo park. we had a little time for a few portraits in their courtyard before heading over to bar bandini for the ceremony. 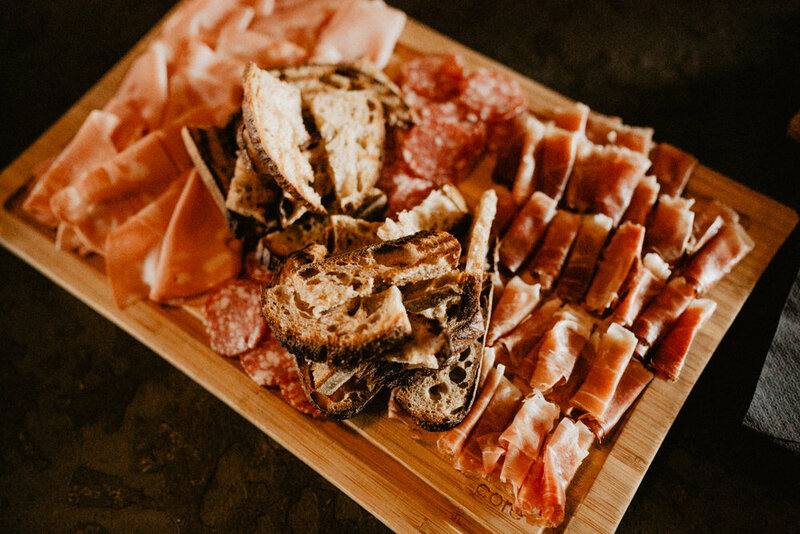 at bar bandini, patrick and rebecca milled about with their guests, sipping on the amazing wine and hors d'oeuvres made by the owner, Josh Weinstein, himself. 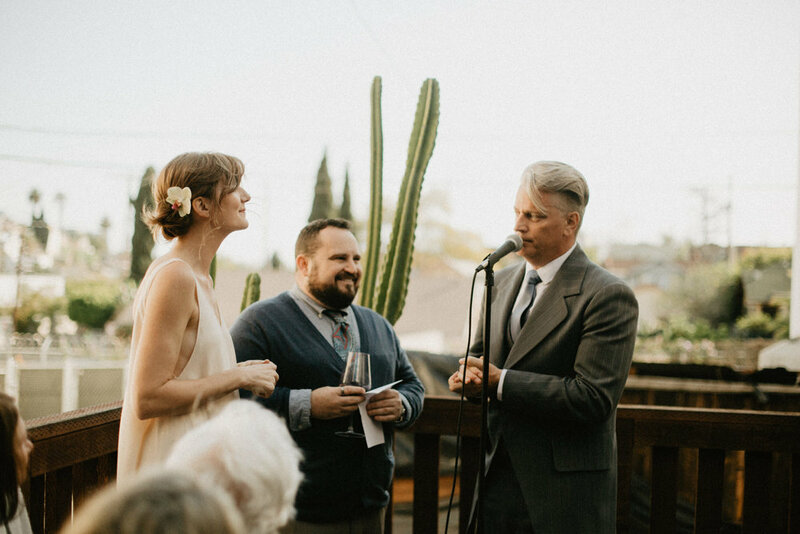 when it was time for the ceremony, everyone crowded around on the back patio with their glasses of wine and patrick serenaded rebecca with a song as she walked down the "aisle" (really just an opening in the crowd). they heard some words from their closest friends and family, had an irish blessing read over them, and then shared some vows with each other. patrick's vows left no one with a dry eye. after a bit more time mingling about, the couple and most of their guests hopped on the number 2 bus and rode it down sunset to akbar, where their friend jen DJ'd an incredible dance party. it was an honor to be a part of their day, i loved all of the special touches that made it "them."